This section sets the context of the energy sectors of France, Sweden, Uruguay, Mexico and Jamaica, before drawing examples from these countries as they relate to the three principles for steering energy systems through transition. The time series analysis throughout this section uses “real-time” measures for the EAPI. In other words, the EAPI methodology has been applied retrospectively for the years 2009 to 2015, aligning the year of the data source to the year of the EAPI score as far as possible (Figure 7). For example, the real-time EAPI 2013 score is primarily based on data sources published for the year 2013. This allows clear links to be drawn between changes in energy-sector performance and causal events. Uruguay‘s total primary energy supply comprises biowaste and hydropower sources, with a growing share of wind and solar, and a large proportion of oil despite the lack of any national hydrocarbon reserves. The country has bolstered its lead over the average EAPI score with balanced performance improvements across all three sides of the energy triangle in the period covered by the time series. In particular, greater diversification of energy sources (0.61 to 0.76) through an increase in renewable energy generation and capacity (0.34 to 0.54), and a reduction in fuel imports (0.27 to 0.83) have driven this improvement. Closer inspection of Uruguay’s performance on the EAPI shows how external events can test an energy system’s strength. Its performance peaked in 2010, reflecting the recovery from a 2008 drought that significantly affected hydropower, a large component of Uruguay’s capacity to generate electricity. This phenomenon was repeated in 2012. In such situations, the shortfall is covered by importing electricity from Argentina and using imported oil to generate electricity, both of which have an adverse impact on several indicators. Diversifying the energy supply, which has in part driven Uruguay’s improving performance, addresses this vulnerability. Mexico is a net exporter of energy principally due to its vast hydrocarbon reserves. The country’s well-diversified total primary energy supply is dominated by these sources, but includes a growing share of renewables, which have significant potential. Under President Enrique Peña Nieto’s leadership, Mexico is undergoing broad reforms in education, financial regulation, taxation, anti-trust, telecommunications and, not least, energy. Major changes in the energy sector include ending a state monopoly on oil and gas exploration and production, transitioning continuously to a low-carbon economy, and gradually liberalizing fossil-fuel prices. The principle driver of Mexico’s accelerated performance was the 2013 decision to phase out fuel subsidies (see Figure 7 for the impact of this move), with the underlying indicators for gasoline and diesel price distortion both ultimately reaching 0.67, from 0.46 and 0.28, respectively. Furthermore, integrating state utility companies into a single entity that is operated more like a private-sector company has significantly improved the quality of electricity supply (0.51 to 0.65). Jamaica’s total primary energy supply is highly dependent on imported fossil fuels, with well over 90% of its electricity sourced from petroleum-based power plants (17). In recent years, lower commodity prices have partially helped to improve the island’s EAPI score by driving an increase in the indicator measuring fuel imports as a percentage of GDP (0.00 to 0.34). In general, Jamaica has generated small but steady improvements across all sides of the energy triangle, including reducing the distortion of fuel prices (0.46 to 0.77 for gasoline, and 0.57 to 0.71 for diesel) and increasing the quality of electricity supply (0.53 to 0.62). If other measures are not taken, the improvement in fuel imports as a percentage of GDP will last only as long as low prices. However, Jamaica is taking steps to reduce the volume of imports as well; it is continuing to decrease energy intensity (0.29 to 0.36), and is taking increasing advantage of alternative forms of energy (0.14 to 0.19) by using its impressive potential in renewable energy. If exploited, renewables could meet 100% of electricity demand (17). Jamaica’s most recent energy policy goals lay out aggressive targets, namely for renewables to reach a 30% share of the energy mix and for energy intensity to be reduced by 50% by 2030. Sweden is one of Europe’s greatest success stories for clean energy production. In 1970, oil accounted for over 75% of the country’s total primary energy supply. The decade’s ensuing oil shocks forced a rebalancing of the energy mix, to a point where low-carbon renewable sources now account for the largest proportion of total primary energy supply, followed closely by nuclear. At the same time, Sweden increased the reliability and comprehensiveness of its energy infrastructure. Accordingly, the country’s consistently high performance was driven by world-class scores on indicators from all sides of the energy triangle, including percentage of energy use from alternative and nuclear energy (0.71), CO2 emissions from electricity production (0.96), PM2.5 levels (1.00), electrification rate (1.00), quality of electricity supply (1.00), electricity prices for industry (0.88) and percentage of population using solid fuels for cooking (1.00). France’s total primary energy supply is dominated by nuclear power, due to a long-standing policy based on energy security. In fact, nuclear power currently generates about three-quarters of the electricity supply. Because the cost of generating electricity is low, the country is the world’s largest net exporter of electricity, which contributes over €3 billion annually to the economy (18). 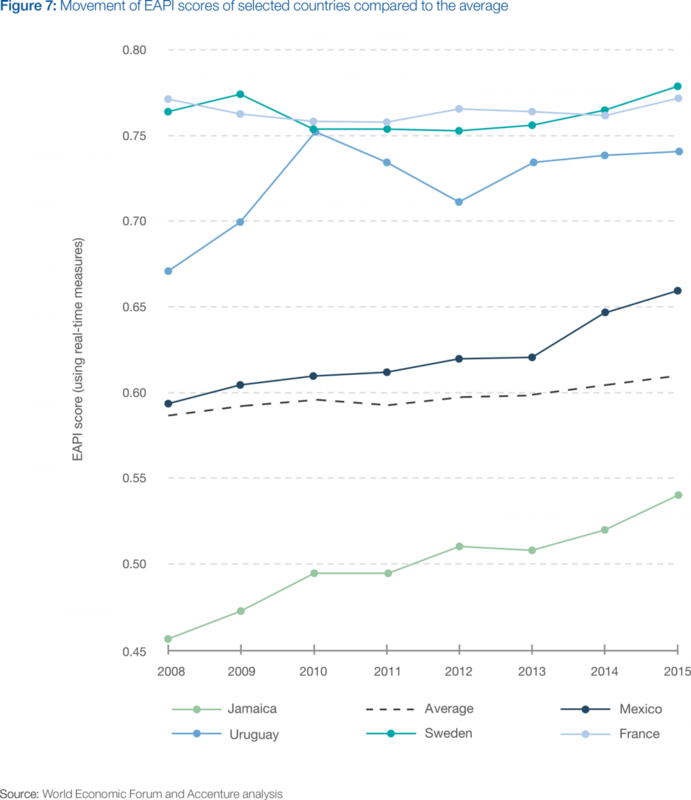 These are the foundational factors for France’s continuously high performance, driving some of the highest scores on the EAPI on the environmental sustainability and the energy access and security sub-indexes (0.81 and 0.88, respectively). More recently, the country has sought to diversify its total primary energy supply away from nuclear, capping this capacity and expanding renewable energy sources to account for 32% of consumption by 2030. Many challenges remain on the path to meeting this ambitious target, including navigating potential supply shortages that result from nuclear reactors being taken offline. Examining the journeys of Uruguay, Mexico and Jamaica, which have made strides in their energy sector performance since 2009, and those of Sweden and France, both of whom have been consistently high performers, revealed three principles that are effective for steering energy systems through transition. This section explores the principles and draws on examples from these countries. Energy sectors are characterized by long investment cycles, as the scale and complexity of their infrastructure mean that change takes time to plan, enact and create an impact. Scale and complexity are critical, demanding a patient and incremental approach. Moreover, because energy architecture is both a local and global issue, nations need to understand the broader implications of their actions, and the international constraints they may face, when creating enabling environments. Setting a frame for the long-term direction of the energy sector helps to stay the course, from planning changes to seeing results. Governments go through several cycles within such long time frames, with room for disruption and substantial change in the sector and the global economy. Today’s energy landscape looks very different to how it did a decade ago, and will likely look significantly different in another ten years’ time. Importantly, to bring greater balance to the energy triangle and enable an effective transition, policy-makers must look to the long term, providing a more stable policy environment based on in-depth understanding of the trade-offs they make. Where possible, decision-makers should aim to take actions that result in positive net benefits for all three imperatives of the triangle. A frame needs to establish a clear vision and direction, while being flexible enough to adapt to changing realities and overcome unforeseeable blocks. A long-term frame provides a vision for the energy sector’s many stakeholders to embrace. As such, a credible commitment to this vision is critical towards creating the required confidence – for stakeholders to make meaningful progress and for investors to commit capital. Credible commitment from the top levels of government means making public declarations of intent that are in line with the vision, and embedding that vision in policy and legislation where appropriate. It further means passing the mandate to act on this vision on to institutions that outlast individual government leaders. This provides a clear and unifying direction for all stakeholders and investors to work towards and be confident that priorities will not change. Uruguay’s long-term vision through to 2030 5 is comprehensive, covering all sides of the energy triangle and providing a clear direction for the sector, while at the same time being inherently flexible. The government has made its vision credible by reaching a consensus on policy among many stakeholders, including opposing political parties, and by having built and involved strong institutions that are independent from politics, such as the national energy companies, Usinas y Trasmisiones Eléctricas (UTE) covering electricity, and Administración Nacional de Combustibles, Alcohol y Portland (ANCAP) covering fuels. Mexico’s established a clear long-term energy strategy through major energy reform, with the main goal to offset a steep decline in hydrocarbon production by accessing untapped deep-water and unconventional reservoirs. The reform materialized shortly before the decline in the price of oil; however, the government’s strongly underlined commitment to the strategy has been key to keeping operators interested in the country’s potential. In 2014, Mexico’s president demonstrated the government’s commitment to the energy transformation when he signed the 21 parts of Mexico’s energy reform into law. Legislation divides the mandate for regulatory oversight of the sector into five separate agencies. And beyond exploiting new hydrocarbon reserves, the country has a clear target for clean energy sources to provide 35% of total generation capacity by 2024, rising to 50% by 2050 (19). Jamaica’s commitment to its long-term 2030 vision for the energy sector is established in the highest level of government. The prime minister has set a clear mandate for every Jamaican to be part of its implementation. The vision is embedded throughout the national energy policy, which in turn is translated into strategies and specific areas of action, such as diversifying fuel sources and developing renewables. The mandate for administering these is given to a range of ministries, agencies and departments. France’s vision for its energy sector was founded strongly on energy security, in response to the first oil shock in 1974. The French government’s strong commitment to this vision over the following decades served as a foundation for establishing the country’s massive nuclear power capacity. More recently, the vision, set out to 2030, has shifted to include greater focus on energy efficiency, reduced emissions and a larger share of renewables in final energy consumption. In 2007, France created a single ministry with the mandate to deal with energy, the environment and land-use, as well as transport issues, in an integrated way under one banner of sustainable development. The size of this ministry, and the importance it has in the overall institutional framework, is a clear signal of France’s continued commitment to its vision for energy transition (20). Energy policies are the tools governments can use to set the conditions for transforming their energy sectors. Quality policies formalize a government’s vision for the energy sector, setting realistic short-, medium- and long-term goals that direct and drive progress. 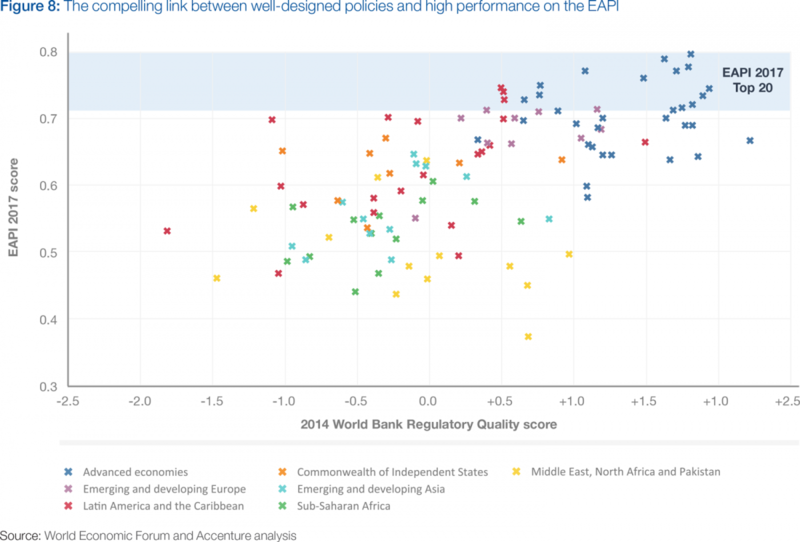 A compelling link exists between well-designed policies, as measured by the World Bank’s Regulatory Quality Indicator6, and the highest-performing countries on the EAPI (Figure 8), highlighting how important policies are to the sector’s governance and to achieving a top-performing energy system. When formulating energy policy, energy sector goals should be aligned with other areas of the economy and related policies. This sets the right conditions for the energy transition, which itself is fuelled by innovation and evolving technologies. Effective energy-sector policies help support this innovation without picking technology winners, allowing the most appropriate solutions to emerge organically. One of the 10 fundamental elements of Jamaica’s long-term strategic vision for its energy sector is that it should have “the flexibility and creativity to adopt and adapt to new and appropriate energy technologies … that may emerge over the long term” (21). Stakeholder groups operating in silos will not create a successful transition. While governments formulate the policies, other stakeholders are ultimately relied on to implement the changes and achieve the goals they direct. To implement policies effectively, however, good policy design involves the implementing institutions and end-users to rigorously test policies and assess their feasibility. Through this process, the formulators and executors build an important sense of joint-ownership ahead of implementation, instilling clear understanding of the policies’ intent among all parties. Mexico’s reforms have required significant institutional development to ensure that stakeholders are aligned to the objectives. Notably, Pemex, the state-owned oil company, is migrating to a model closer to that of a private-sector company, while the electricity sector has opened up to private investment (mainly in generation) in some stages of the value chain. The government additionally created new regulatory agencies, and significantly increased the budgets of others – fivefold in some cases – so that reforms could be more easily implemented. Sweden’s central government leads energy policy design, with support from several implementing national and local authorities. The government gives administrative boards the mandate to formulate regional energy and climate strategies and to represent it at the regional level, in collaboration with regional actors (22). Uruguay laid the foundations for successful policy design in 2005 by creating an interministerial coordination group, which brought together all national entities involved in the policy-making process to start a dialogue on energy policy goals. At least 11 institutions are involved in the process, ranging from ministries focused on agriculture to sports and tourism. This broad dialogue and coordination among stakeholders has been critical for effective policy design, with clear mandates and a sense of shared ownership creating the conditions for successful implementation. Cooperation with UTE and ANCAP throughout the policy-design process had also been a key success factor for implementation. Significant investment is required to make progress on the energy transition and meet growing energy demand. The IEA estimates that $48 trillion in investment is needed globally to meet energy needs to 2035 (11). To invest with confidence, industry will need stable policy regimes to allay both the regulatory risk of the initial investment and the refinancing risk. National elections will likely occur during the long lead times involved, as well as several changes of government over the investment’s operating life. Policy support is thus required not only from the incumbent government, but also through a long-term strategy with broad-based political support. Jamaica’s long-term vision and expressed commitment are complemented by many opportunities for private-sector companies to invest in its energy sector, including a deregulated generation environment, a liberalized fuel sector and opportunities for commercial hydrocarbon exploration. Private-sector investment requires stewardship to ensure it focuses on the right areas. Choosing the right public-private-sector partnership models is important to promoting investment that focuses on areas best serving the overall vision. In some cases, the need for investment means opening up historically publicly monopolized energy sectors to the private sector, as Mexico has done successfully with its oil and gas and electricity sectors. Innovative approaches are required to ensure investment is stewarded to maintain an attractive environment for investors. This was achieved in Uruguay by framing private projects within contracts with public companies. Other tools include target setting, bidding processes and long-term contracts. More conventionally, the country is also ambitiously promoting offshore exploration to find and develop potential domestic hydrocarbon resources. Within Jamaica’s liberalized generation market, the government has issued requests for proposals for energy plants to add capacity to the national grid, specifying the range of renewable technologies that could be used (23). The construction of France’s nuclear-dominated energy sector, which began in earnest in the 1970s, was financed with a mix of commercial loans and investment from financially strong and vertically integrated state-owned utility companies, such as Électricité de France. More recently, as the country looks to diversity its energy mix with renewables, a number of steps have been taken to secure the investment required to drive this transition, including simplifying administrative procedures, increasing the number of calls for tender, improving financing conditions, and supporting French industry and the emergence of innovative technologies (24). The early deregulation of Sweden’s electricity markets in 1996 helped to unlock the private investment required to drive the technological innovation underpinning much of sector’s efficiency today. Sweden was the first country to install smart meters for its customers (in 2009). It also collaborates with Norway to issue green electricity certificates to producers as part of a market-based support scheme designed to boost renewable electricity production in both countries. The scheme is technology-neutral, with all forms of renewable electricity entitled to certificates. By creating demand through government-imposed quota obligations, it establishes the certificates’ value, which means the market determines the price of electricity certificates and which projects are developed. Producers of renewable electricity gain additional income from selling certificates, which increases the attractiveness of developing new electricity production based on renewable sources (25). Mexico’s recent structural reforms have developed new special investment vehicles designed to spur investment in energy assets and a wider range of industries. Fibra E allows the state-owned productives to monetize revenue streams arising from mature energy and infrastructure projects, to some extent replicating the master limited partnerships which fuelled the US shale boom. Additionally, Investment Projects backed Certificates (CerPI) a new investment vehicle for private equity with flexible corporate governance, is designed to attract top local and international institutional investors. The Mexican government has also engaged in significant public policy and development by creating scholarships and training to study energy-related disciplines, investment within non-profit institutions and the promotion of domestic energy-related industry. These are strong examples of being inspired by successful methods in other countries and reinterpreting them so they align with a country’s own national interests. In addition, the Mexican Senate has agreed a comprehensive range of fiscal regimes for international oil companies and service providers to attract international investment and participation. Uruguay, Mexico, Jamaica, Sweden and France exhibit many differences, from the scale of their geographies, populations, economies and energy sectors through to the composition of their primary energy supplies and endowment of natural resources. This diversity is indicative of the huge range of contexts across the EAPI’s 127 ranked countries. Accordingly, the five countries show many differences in how they have steered their energy sectors through transition, as demonstrated by the wide breadth of the examples. Setting a frame for the long-term direction of the energy sector, and committing to it, will help bring greater balance to the energy triangle and enable an effective transition in the long term. Enabling the energy transition with adaptable, co-designed policies will support the sustainability of energy policies. Stewarding investment to the most impactful areas unlocks and focuses the capital required to fuel the transition. These principles are mutually reinforcing, building on each other to allow for robust energy architectures that provide affordable, secure and sustainable energy. 5 The vision as laid out in the Energy Policy 2005-2030 is to “satisfy energy requirements, at accurate and competitive costs, promoting good energy consumption practices towards energetic independence, in the framework of regional integration, using energy policy as an instrument to develop productive capacities and to promote social integration” (30). 6 The Regulatory Quality Indicator, part of the World Bank’s set of worldwide governance indicators, is formed from sources that measure concepts such as unfair competitive practices, price controls, discriminatory tariffs, the effectiveness of anti-trust policy, investment and financial freedom, ease of starting a new business, regulatory burden and tax inconsistency (31).